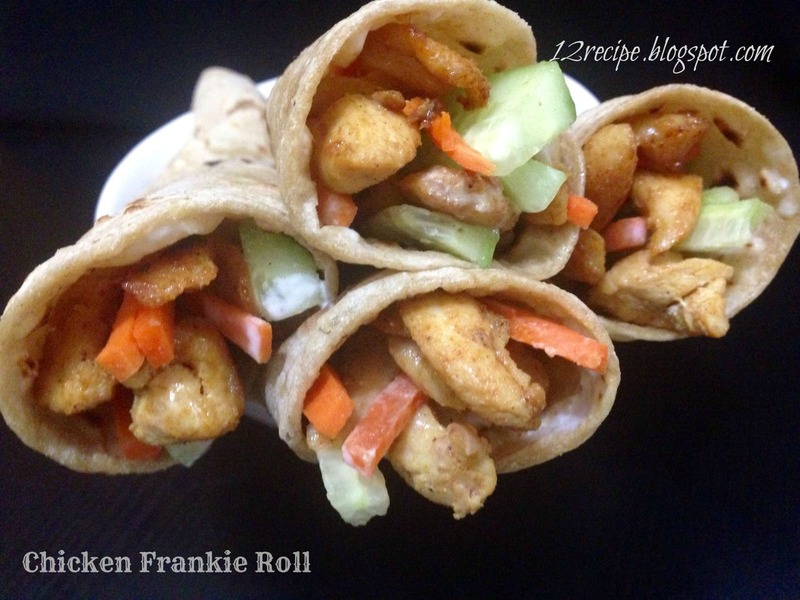 Chicken frankie roll is one of the most popular Indian fast food. Here the spicy chicken boneless strips are wrapped inside a paratha with other yummy fillings. It is very easy to prepare and easiest to eat. You can use any additional fillings inside according to your choice. This quick rolls are a great tiffin box idea too. Marinate thinly cut chicken strips with turmeric powder, chilly powder, garam masala powder, 1 tbsp of curd and salt for 15 minutes. Stir fry it oil until cooked. Keep it aside in a plate. Cut onion, carrot and cucumber in to strips like pieces/. In a bowl; Mix mayonnaise with curd, lemon juice, salt and garlic grated. Beat eggs well with little salt and pepper powder. In a non-stick pan add the cooked paratha and above that add a thin layer of beaten egg. Cook it on low heat for a minute until the egg portion cooked and stick well on the paratha (turn in to the other side after 30 seconds). In this way prepare remaining four paratha’s. Roll it tightly and serve soon.